What is all this about? 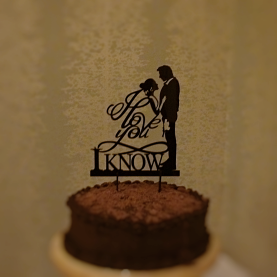 Have you ever tried to find Party Ideas, Wedding and Other Occasions on the Web. As Old Geeks there has been many a frustrated search to find items that would compliment any Sci-Fi occassion. OSGR writers have been there and have the blisters on the fingers to prove it. So as Search Engines have been bashed and popular sites have been stripped for little the dilithium crystals of decent geekandise, OSGR will present them here. Geek out. At a recent Old Geek wedding there appeared to be a distinctive Star Wars theme. As the wedding party settled, the bride and groom revealed the central piece to the wedding breakfast (don't ask why its called a breakfast, its just a wonder of the universe). 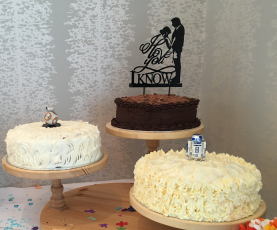 The cake was topped with a fine caricature of Han Solo and Princess Leia in the iconic I Love You, I Know line from Empire Strikes Back (or V for those into roman numerals). 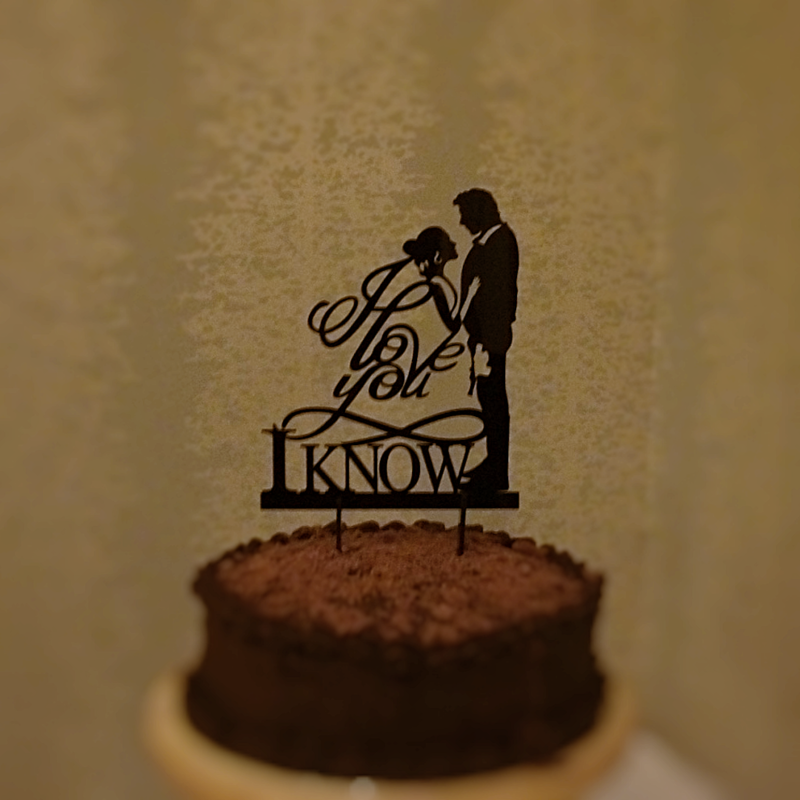 The black acrylic topper stood about 10" High (Width: 5"- 6" & 1/8" Thick), the makers indicate that it fits a 5"- 8" top tier cake (well you would never guess how important these details are). The topper comes from Amazon a great source for lots of Geekendise. 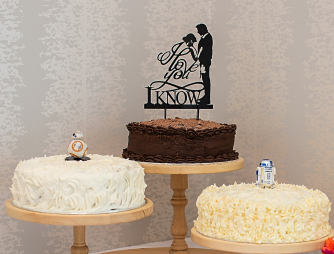 It was quite a centre piece to an Old Sci-Fi Geeks wedding it has to be said. Subtle and unobtrusive it matched perfectly to the little R2D2 and BB-8 that adorned the lower tiers. Not a bad little find it has to be said. Geek Out. There is a time in an Old Sci-Fi Geeks life that they have to relinquish part of their love for all things Sci-Fi and give that fragment to someone else or just pretend to. 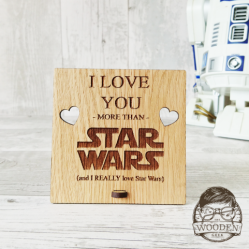 Well what more can there be on valentines, birthdays or even Hogswatch to show them significant others (who may I dare to say it ... may not be a geek) that you care. But we are geeks and we need to let them know that there is another competing for that love. This great little plaque made by The Wooden Geek (great name) expresses that beautifully. 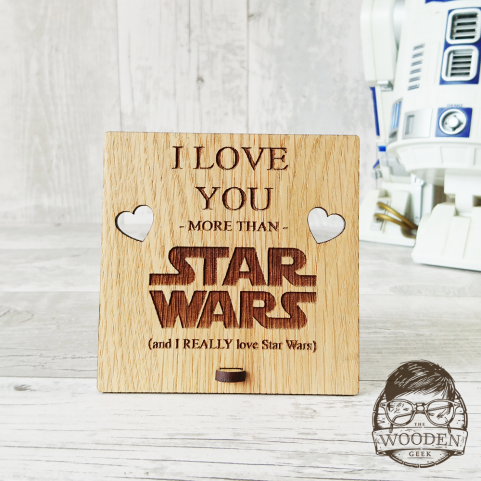 It stands 4"x4" and expresses the desire in a pressed and cut wooden plaque. 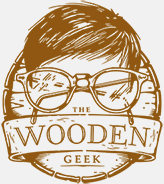 The message speaks for it's self and will gladden any geek heart. 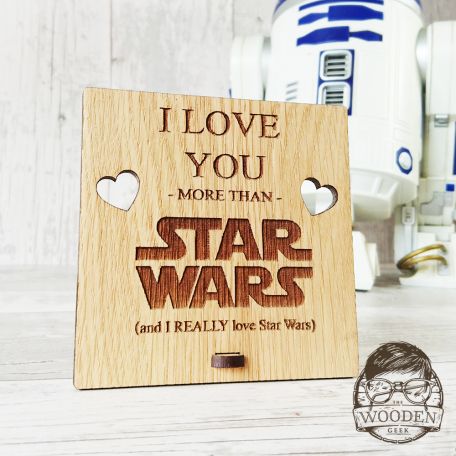 There are other designs, but what else can a true Star Wars Geek say other than this. Brings a tear to the eye. Geek Out.